For those who know me, they'll know that I can't drink coffee because it gives me palpitation. So while others enjoy coffee when they go out cafe-hopping, I am more of a tea person. And while others enjoy drinking a good cup of coffee, I enjoy using coffee... On my face & body! ;) Let's get down & dirty! 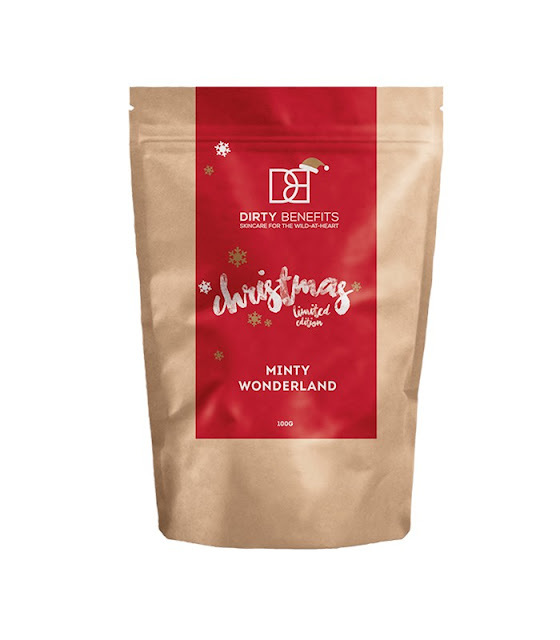 Dirty Benefits is an all-natural skincare brand that is kickstarting with their range of coffee scrubs. You must be wondering, why caffeine? Natural coffee scrubs are not just great as an exfoliant to gently remove dead skin cells, blackheads & whiteheads, but it also stimulates blood flow and are awesome for reducing appearance of cellulite, eczema, stretch marks, scars, age spots, psoriasis and other tough skin problems, without the use of chemicals or parabens. Dirty Benefits uses only 100% Arabica ground coffee in all their scrubs. Mmm.. Each pack of Dirty Benefits Coffee Scrub is lovingly packaged in a cool box that resonates with their brand style and also comes with a wooden spoon. Each spoonful is packed with raw brown sugar to gently exfoliate the skin, pink Himalayan salt to detoxify & de-stress the skin while improving circulation, cold pressed grapeseed oil to tighten skin while keeping acne at bay with its anti-inflammatory and antioxidant properties, cold pressed coconut oil to deeply hydrate, soothe & moisturise the skin and cold pressed avocado oil to increase collagen production to keep skin young, smooth & plump. It smells exactly like coffee and the scent alone can wake you right up! To use, first you have to pat a spoonful of #DirtyBenefits onto targeted areas while in the shower (so it doesn't get messy everywhere). Gently massage in circular motion for a few minutes and rinse off thoroughly then pat the skin dry. It is recommended to leave the scrub on your skin for 5 to 10 minutes and to use the product within 3 months of opening. You'll only need a little bit to go a long way so one pack can last quite a long time in my opinion. I've been loving this coffee scrub so far! While the scrub may be a little rough on sensitive skin, it is still bearable. My tip is to just add more water and not scrub too hard, else your skin will become red. I love how my skin feels after I use it, sooo baby soft & smooth! My bathroom smells like a cafe everytime after I'm done and the smell just makes me feel instantly refreshed. Since I can't drink coffee, this is the next best thing I'm going to get to keep me awake. I use the scrub about 3 times a week and this is the only scrub I've tried that actually makes me look forward to showering just because of how great my skin feels after that! I've also tried the scrub on my face but because it's quite rough on the skin, I only use it once a week and only use a small amount at a time. The results is just as good on the tough skin on my elbows or knees - it leaves my skin looking fairer, brighter and smoother. There are less bumps and acne scars after I use the scrub, which is why I trust it so much. - Leaves my skin feeling super soft and smooth after each use! It's safe to say that I'll definitely be repurchasing this coffee scrub and will recommend it to my friends! While the price point may be a little high, we should remember that it's an all-natural product and furthermore, it works! If you're thinking of trying it out too, you can use my code 'DBCARINNTAN' to get RM10 OFF your purchases, valid until 31st January 2016! Here's my #DirtyBenefits experience, what's yours? Btw, you can now preorder this limited edition Minty Wonderland Coffee Scrub that leaves your skin minty fresh & baby smooth! It's a special Christmas edition in a special Christmas packaging for only RM39, and I so want it! Disclaimer: Even though the product was sponsored, the review is based on my honest personal thoughts, experiences and preference after trying out the product. Effects may vary according to individual and how you use it.